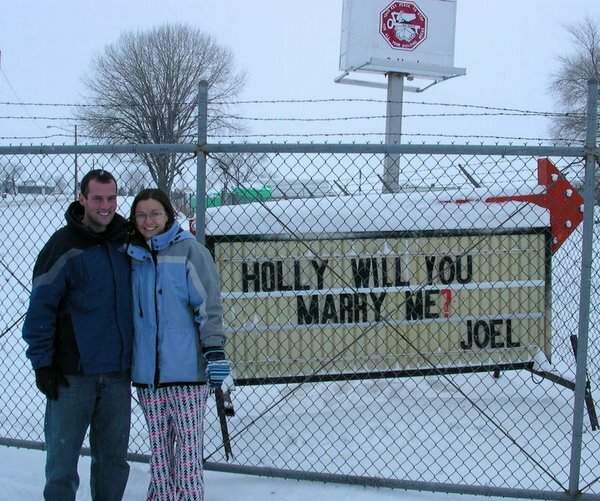 On December 22, 2008 I purchased a wedding & engagement ring set for Holly Jo Heringer at Johnson Jewelers in Madison, SD. The ring is white gold and has a 1/3 carat round-cut center diamond with 6 smaller diamonds in the band, 3 on each side of the center diamond. The wedding band includes 6 more diamonds that surround the large diamond. When I had finally selected this ring for my future bride the jeweler measured it and the size: six. A perfect fit for my perfect girl. Thank you Lord for working in so many details! The style of the ring was inspired by Holly’s mother’s ring. Several friends in Madison were shown the ring. Family and other close friends were called with news of the purchase. 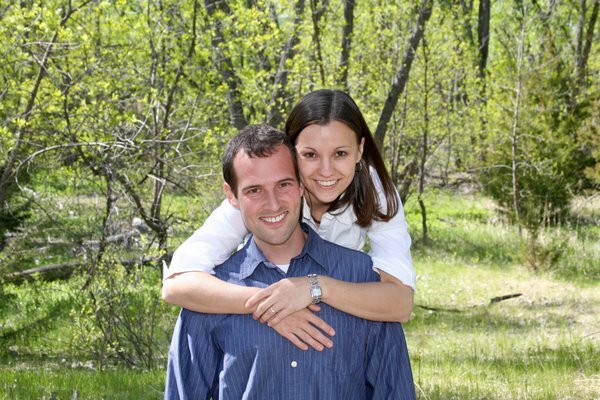 Holly and I celebrated our 4-month dating anniversary on December 23, 2008. On that date, I put in a full day of work at Commission Soup before driving to Beulah, ND to spend the long Christmas weekend with Holly’s family. I met Holly in Bismarck and we hung out with friends for about an hour before driving to Beulah. I stayed at Holly’s parents’ house my first two nights in Beulah. On the third night I slept at Mark Jaspers’ apartment. There had been a lot of snowfall in Beulah and there were several cars on the street in front of Heringers’ because of the full house so the decision was made to move the cars owned by Lexi, Seth & Stacia and Joel to the lumber yard so the street could be plowed. Les snapped a couple of photos of me setting up the sign. After getting the sign set, I drove back to the house to find Holly still in her pajamas. Barb needed to do some shopping and was willing to pick up those of us who would drive cars to the yard on her way back from the store. I didn’t know if Les had already talked to Barb to share the news of the proposal and she didn’t give me any indication that she knew. I asked Holly if she wanted to shower before taking the cars to the yard knowing she would probably like to be cleaned up if she knew what was coming. She didn’t think there was enough time to get ready before Barb was leaving for the store so she decided not to shower. I hadn’t showered yet either so I took the opportunity as it seemed there was enough time for me. Barb was talking on the phone so she wouldn’t be leaving for a while. I checked to make sure the ring was oriented properly in its case and I tucked the case away in my coat pocket. I could hardly contain the excitement. I was ready to ask Holly to marry me! When I finished showering, Holly, Seth and I left for the yard. I was in front driving my car followed by Seth driving his car followed by Holly driving Lexi’s car. I made sure to get in the front spot so that I could stop in front of the sign and make my pitch. I was hoping that with Holly in the last spot that her view of the sign would be impaired by the cars in front until we were close so that it would be a big surprise. I put on my hazard lights as we approached the front gate of the yard to give Seth a bit of a warning and pulled in just far enough for all three of our cars to get off Front Street. My heart racing, I stepped out of my car and began the short walk back to the car holding my love. As I passed Seth’s car my eyes locked on to Holly. I could tell by the expression on her face that she had read the sign. My head was spinning. When I stepped up to her door I helped her out of the car, retrieved the ring out of my coat pocket, opened its case and held it before her. I said, “Holly Jo Heringer, I love you with all my heart. I want to spend the rest of my life with you. Will you be my wife?” She said, “Yes.” We embraced tightly. Then I asked politely, “Is it alright if I kiss you?” She said, “Yes.” And for the first time in our relationship we kissed on the lips, my first kiss ever. After the brief and awkward lip locking Holly said, “We need to work on that.” I was a little embarrassed by my performance but found humor in the comment. Then I got to thinking that I REALLY look forward to working on that.